It is tough to be Wayne Dobson in Las Vegas these days, or at least the place where he had resided peacefully for a number of years. 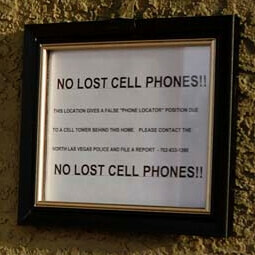 Turns out that a Sprint cell phone tower triangulation glitch, or something of a similar nature, is always pointing users of the Find my iPhone feature in the area to one and the same house - Wayne Dobson's house. Most everyone who relies on Sprint to point where their lost or eventually stolen iPhone is right now, ended up armed with Mr Dobson's address, and, we presume, a lot of anger. It began in 2011 when a couple came to his doorsteps to look for their handset, then one more person showed up, then it was a constant onslaught of people arriving with tablets and laptops, arguing that this is the address the service gave them to find their device. In this day and age of frivolous litigation and lax gun control, Sprint seems lucky that Mr Dobson doesn't strike as the litigious type.To make matters worse, the rogue cell phone tower triangulates 911 calls from this area near Wayne's house, too, so he used to end up with police on his lawn and searched before the cops realized their mistake and apologized. Wayne's world. He must be a nice person not to have sued sprint, even though he is in America where people use all excuses to sue others and make money. I bet some lawyers are already talking to him, encouraging him to make some money suing Sprint. Poor guy, that's bulls**t. Sprint is lucky that he's nice, or else they could face a fine and bad credibility. He's 59 too, the man is just trying to sleep and enjoy what's left of his life. Smh. From experience most of the people losing their phones in Vegas are either drunk, irresponsible idiots or both. The couple in the article banged on his door aroudn midnight and demanded their phone back without first contacting the authorities. A lot of these encounters sound like confrontation of the ME Generation morons so attached to their little toys. Since police have also been redirected to his home Sprint should be held liable. Something tells me he's definitely not a sprint customer (or maybe he is if they bought him off lol).